Laundry generates humidity and moisture, creating the right environment for mould. Your laundry room is a prime spot for mould growth. Humidity build-up and/or faulty connections from washing machines and dryers can cause excess moisture, which can lead to mould in ceiling corners, exposed piping, and under leaky appliances. Simply spray a thin, even layer of Concrobium Mould Control onto the mouldy surface. Allow to dry; Concrobium works as it dries to crush and eliminate the mould spores at the roots but will not change the color of the mould. Be sure to have proper ventilation and equipment connections to washing appliances to avoid excess moisture and humidity build up that cause mould growth. Musty clothes, fabric and towels? Try soaking (or simply spraying) them in Concrobium Mould Control and then allow to dry. When Concrobium Mould Control dries on the mouldy material it will encapsulate the mould and crush it right down to the root structure. Once dried, launder if desired. The solution eliminates mould and mildew along with the associated odors, leaving a fresher and/or neutralized scent. 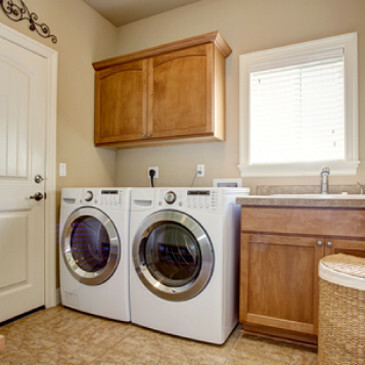 Front-end loading washing machines sometimes develop mould on the rubber gaskets between the drum and the door, resulting in a damp, earthy smell. 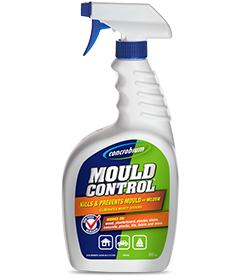 Try spraying Concrobium Mould Control onto the surface and allow to dry. Then clean the area with a Concrobium dampened cloth, leaving a thin layer of the product on the surface to protect from future mould. Leave the door open to allow the product a chance to dry completely on the surface before use.